Ever since we moved in to the new house, I feel like every weekend or evening has been filled with one project or another. I’ve been throwing a lot of things at Jay lately (let’s paint this room, let’s build a table, let’s hang some pictures!) and mooooost of the time he’s been taking everything in stride. So since we had an extra day at home this week with the Labor Day holiday, I knew I wanted to take advantage of it to get some work done…but I also wanted to treat Jay to a nice little breakfast. Sort of like a thank you plus “I’m gonna sugar you up because I’m going to ask you to do more projects” kind of meal. Lucky for me, I think it did the trick. Jay is huge on breakfast potatoes, especially any time we go out to eat for breakfast, so I decided to take a shot at making some really good, restaurant-quality ones. And to help, I turned to Salted. Have you guys heard of it yet? I was just recently introduced to it, and I’ll tell you, I’ve been having such a blast browsing through the site seeing all sorts of different ideas and things to make. So what exactly is Salted? Salted is an online cooking school with 75 (and counting) of the best chefs from across the country (basically, think Netflix for cooking school – so cool). And fun fact on the name: “Salt” is the foundation of cooking and the suffix “ed” speaks to the value they place on education (as well as entertainment). 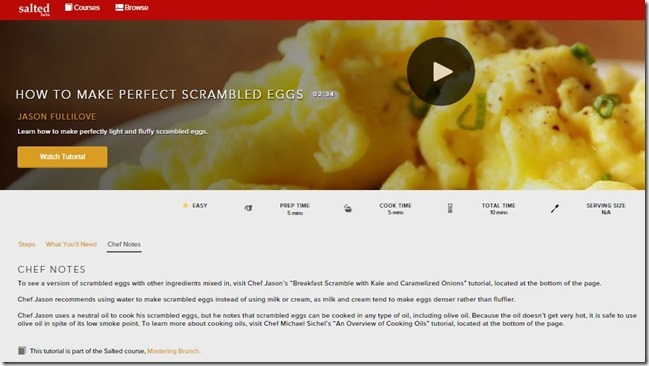 The idea behind the online cooking school was to offer a more affordable type of cooking class and course to anyone who was interested, because learning to cook today can get expensive. Cooking Classes can be upwards of $100, and Culinary school can be as high as $50,000. 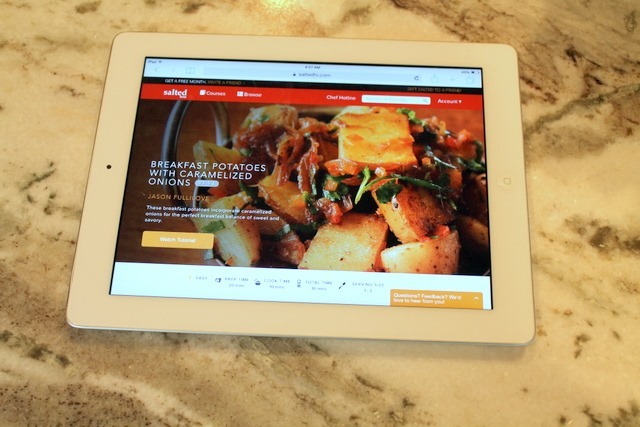 Their mission is to offer a $50,000 culinary education for just $9.99/month or $99/year. Members get access to exclusive classes, tutorials, and a VIP chef hotline that provides an answer to any culinary question in under 30 minutes. Interested in giving it a try? Well lucky for you guys, the first 50 readers to use promo code SWEETTOOTH will get 3 free months of Salted TV! It’s the perfect opportunity to give it a try. 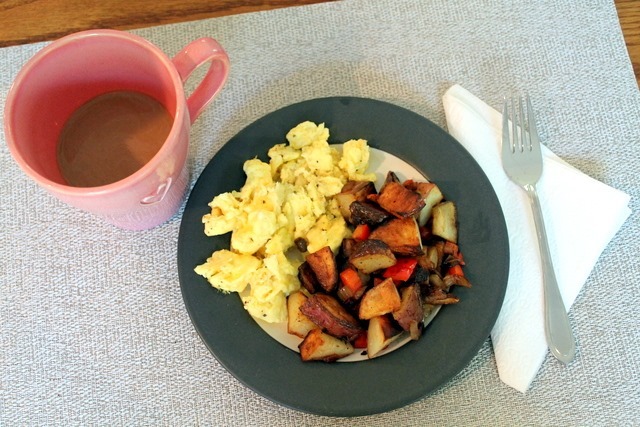 So for my special breakfast for Jay, I knew I wanted to do some breakfast potatoes, but of course, you can’t have breakfast potatoes without eggs, right? 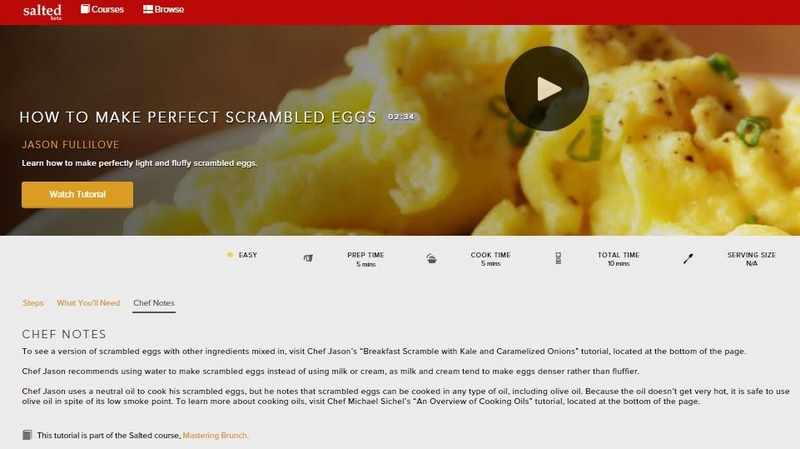 I decided to check out the other videos that Salted had for breakfast/brunch, and I also came across one for how to make perfect scrambled eggs. This is something that intrigued me right off the bat, because I’m always trying to figure out how to make my eggs taste as good as the ones you get from a diner. You know how they’re just always a little different?! Well, turns out, this video actually said to mix the eggs with water as opposed to milk (which is what I’ve always done). Apparently, the milk winds up making eggs more dense rather than fluffy. Who knew?! The meal was definitely a bit more effort than what I usually put into breakfast, but everything was WELL worth the effort. I’m gonna pat myself on the back for this meal, and I might even go as far as saying that these recipes could rival a diner meal. So if you want to make a special breakfast this coming weekend for yourself or your family, go ahead and give these a try! I made a few minor tweaks to the ingredients of the original recipes on Salted, but everything else remained the same. **For the caramelized onions, I cooked mine in some butter over medium heat for about 5-6 minutes until browned and they were pure perfection. *Optional: Before starting, blanch the potato pieces in salted, boiling water for about 5 minutes then transfer to an ice bath to stop the cooking process. 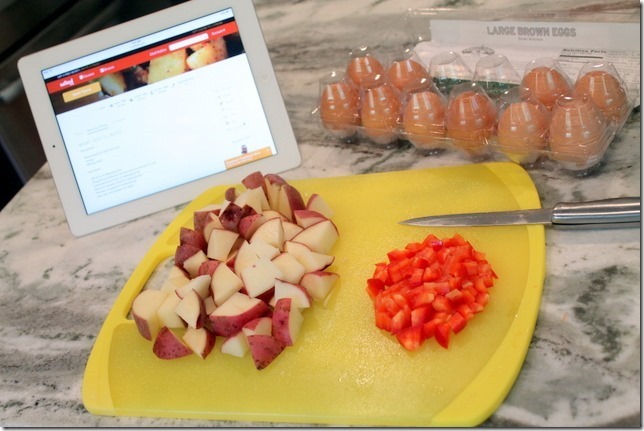 This will help the potatoes brown a bit easier in the skillet! Place a nonstick skillet over high heat. While the pan heats, drizzle in enough oil to coat the bottom. Add the potatoes to the pan. Flip over the pieces so the cut-side faces down. Cook the potatoes without moving the pieces until the bottoms are golden brown and caramelized. As the potatoes continue to cook, season the tops with sea salt and freshly ground pepper. After several minutes, use a pair of tongs to check the color of the bottom of a potato. If the piece sticks to the pan, it need more time to cook. Add additional oil as needed. 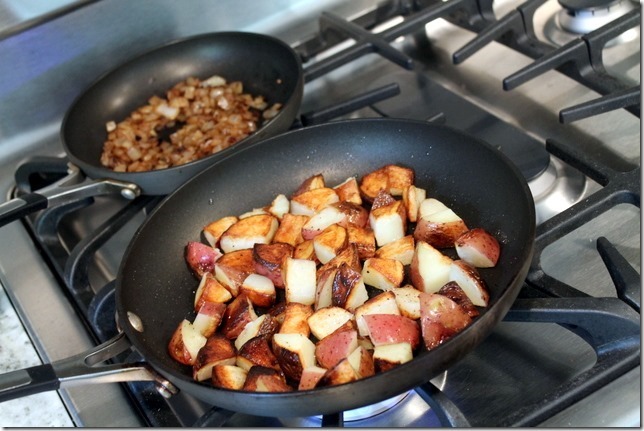 When the potatoes move around the pan easily, the bottoms are likely seared and the pieces can be flipped over. Use tongs to turn over each piece. If any piece is still white at the bottom, let it cook longer. 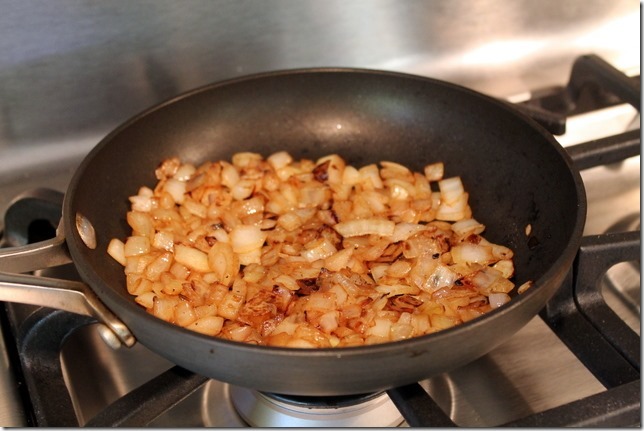 After flipping the potatoes, add the caramelized onions to the pan. Distribute the onions evenly across the potatoes. Allow the mixture to continue cooking. Add the bell pepper and parsley to a mixing bowl. Transfer the potatoes and onions to the bowl. Toss to combine. Add additional seasoning as necessary. Plate the potatoes and serve warm. Crack eggs into a mixing bowl. Add water and whisk vigorously until air bubbles start to form and the eggs are more watery in texture. Heat a small sauté pan over medium heat and coat the bottom of the pan with butter or oil. 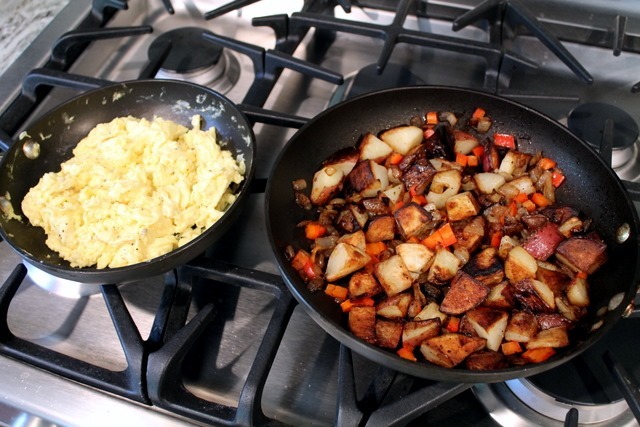 Once the pan is warm, add the eggs to the pan. Continually stir the eggs as they cook. This helps to keep the eggs from sticking to the pan and allows them to evenly cook. Be sure to monitor the heat through the cooking process. If the pan gets too hot and the eggs begin to brown, remove the pan from the heat and cook the eggs using residual heat left in the pan. The eggs are done when they are light, fluffy, and steaming. 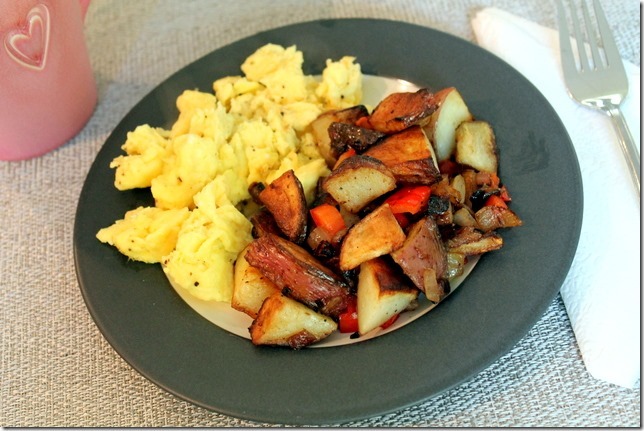 Remove the eggs from heat and season with salt, pepper, and chives. Serve while hot. We recently moved to and I hear you on the projects - I find it hard to prioritize. 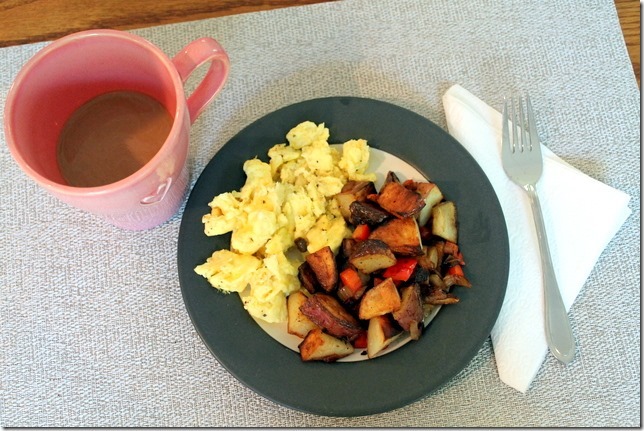 I just want to do it all now ;) I'm totally an eggs and potatoes gal for breakfast - this looks delicious! Can't wait to check out Salted - thanks for sharing. Never heard of salted edits but sounds good! Can't ever go wrong with Carmelized onions! What a neat idea! I love cooking and think this would also make a great gift idea! I've never heard of Salted before, what a fun idea! I'm starting to get more into cooking thanks to Plated and Blue Apron programs too! That sounds really cool! I love that idea! I have been to several in-person cooking classes and they are a lot of fun but I actually really want to learn some new skills with the tools I have at home. I love this idea. I'm always looking for cooking tips and tricks and this site looks so perfect! Thanks for highlighting it! Looks amazing! I recently (last week) discovered I don't know how to make scrambled eggs. Apparently I never tried making them before and I've failed miserably. Twice ow. Thanks for sharing....signed up for SALTED and got 3 mnths for free....so excited to learn something new!!! My boyfriend is going to want to kiss you! I've been telling him for ages that I want to take some cooking classes. I've already taken advantage of your promo code and signed up. I can't wait to get home from work and check it out a little more! Thank you!! P.S. Making a batch of your pumpkin spice cupcakes with honey cinnamon cream cheese frosting this weekend. My favorite fall cupcakes. I have always wondered how diners are able to make their eggs look so perfect and fluffy! Now I know! This meal looks so delicious, thanks for sharing! I love eggs and breakfast potatoes, and the idea of Salted is so cool! Something I would love to do with an So someday.